No you are not going crazy. No you do not need glasses. And yes what you always knew was a half gallon, has secretly shrunk (but not the price of course) and the manufacturers never thought we'd notice! Seriously I bought some Edy's ice cream for the family since my homemade production is at a low these days and brought it home a quickly started to eat our way to the bottom. Next day I just needed to run in the supermarket for something quick and as I strolled through the freezer section something caught my eye. How come the Edy's containers are short and stubby. Do they now offer a pint? No, they just shrunk the packaging and contents by such a minimal amount that its almost tricky to the eye. It now contains 1.5 quarts and the original container contained 1.75 quarts...all for the same price! Breyer's, same thing. So now when you think that Ben & Jerry's seems more expensive, think again and go for the premium! 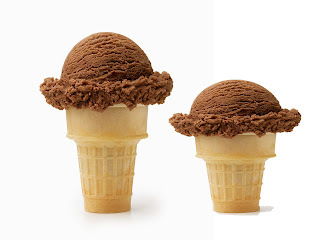 The International Dairy Foods Association website states that "annual U.S. ice cream sales exceeded $21 billion dollars.” so I doubt this change in size will hurt these manufacturers too much but regardless its a deceiving way to get us consumers to once again pay more for less. So all you ice cream making friends....more reason to start churning! See, what I find weird about this - is what do I do, when I make my ice cream bombes, which use a certain amount of ice cream? That's just ridiculous. It IS a good reason to start making out own ice cream. And just sad that we're being tricked and swindled every which way.